The brilliant physicist Richard Feynman famously said that, in principle, biology can be explained by understanding the wiggling and jiggling of atoms. For the first time, new research from the University of Bristol, UK and the University of Waikoto, New Zealand explains how this 'wiggling and jiggling' of the atoms in enzymes – the proteins that make biological reactions happen – is 'choreographed' to make them work at a particular temperature. Enzyme catalysis is essential to life, and this research sheds light on how enzymes have evolved and adapted, enabling organisms to evolve to live at different temperatures. This is the first study to link the enzyme's dance (in atomic detail) directly to its optimal temperature. These findings provide new insights into how the structure of enzymes is related to its role as a catalyst and importantly, could provide a route to designing better biocatalysts for use in chemical reactions in industrial processes, such as the production of drugs. It also hints at why proteins were eventually preferred by evolution over nucleic acids as catalysts in biology: proteins offer much more ability to 'tune' their 'jiggling and wiggling' and their response to chemical reactions. Dr Marc van der Kamp and Professor Adrian Mulholland (Bristol) worked with Professor Vic Arcus (Waikoto, NZ) and colleagues, to find how the 'wiggling and jiggling', or the dynamics of enzymes is 'tuned down' during the reaction they catalyse. As a result, the heat capacity of enzymes* changes during the reaction, and it is the size of this change that is the critical factor in determining the temperature at which the enzyme works best. Dr Van der Kamp said: "Our computer simulations of the 'wiggling and jiggling' of enzymes at different stages in the reaction tells us how these structural fluctuations give rise to the difference in heat capacity, and thereby can predict the optimum temperature of an enzyme. Our work demonstrated that we can do this accurately for two completely different enzymes, by comparing to experimental data. 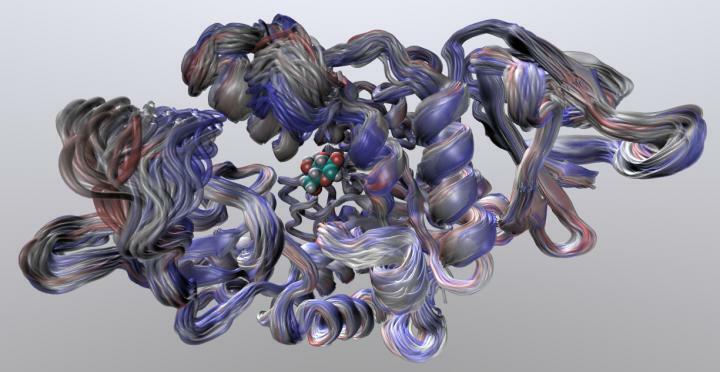 "What is fascinating to see is that the whole enzyme structure is important: the 'dance' does not only change close to where the chemical reaction takes place, but also in parts much further away. This has consequences for evolution: the combination of the enzyme structure and the reaction the enzyme catalyses will define its optimal working temperature. A subtle change in structure can change the 'dance'." The work helps explain how organisms can evolve to live at different temperatures, and hints at why proteins were eventually preferred by evolution over nucleic acids as catalysts in biology: proteins offer much more ability to 'tune' their 'jiggling and wiggling' and their response to chemical reactions. Enzymes have an optimum temperature at which they are most catalytically active. Above that temperature, they become less active. The textbook explanation is that enzymes unfold (lose their functional shape), but this is not correct. Instead, a basic physical property – the heat capacity – explains and predicts the temperature dependence of enzymes. The heat capacity changes during the reaction and is 'tuned' to give the optimal temperature.